As a vocal advocate for robust national funding for Alzheimer's disease research, DelBene wants a deep understanding about how our NIH-funded work furthers the first goal of the National Plan to Address Alzheimer’s Disease — preventing and effectively treating Alzheimer’s by 2025. She needs quick ways to communicate to her colleagues about the role of Medicare and Medicaid to patients, caregivers, and medical research centers—without getting into the weeds. 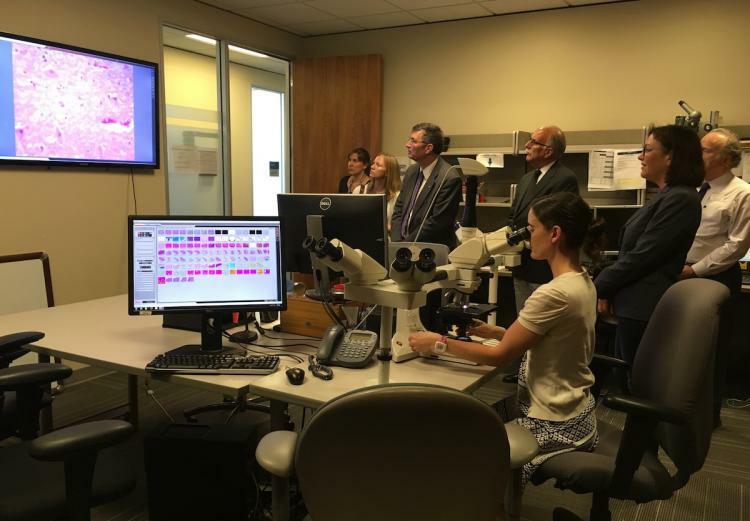 Last week, the UW Alzheimer's Disease Research Center (ADRC) had the privilege of hosting the Congresswoman and her aide for an informational tour. The Alzheimer's Association WA State Chapter co-organized the visit. Here are the tour highlights. These measurements are collected in a standardized way across all 30 ADRCs across the country, explained Kimberly Lowell, ADRC research coordinator. Once analyzed, the data from the neuropsychological testing and blood and spinal fluid samples are uploaded to centralized databases maintained by the Alzheimer's Disease Coordinating Center (NACC) and the National Cell Repository for Alzheimer’s Disease (NCRAD) and made available to Alzheimer's disease researchers across the country. Relating these efforts back to the brain, Thomas Grabowski, Professor in the UW Dept. of Neurology and Director of the ADRC, described his project funded in the current ADRC funding cycle. His team uses functional magnetic resonance (fMRI) brain scans that reveal changes in participants' brain activity as neurodegenerative conditions such as Alzheimer's, Parkinson's, and frontotemporal disorders develop. He wants to correlate these fMRI findings with blood and spinal fluid biomarkers over time, to find out if they are useful in predicting a person's disease progression or response to treatment. Ultimately, this work could lead to a simple screening test to determine a person's disease subtype and stage, and then direct them to the most suitable early intervention or clinical trial. Reaching this precision medicine future will require a perspective shift in our culture, he noted, in which stigma and a sense of hopelessness surrounding dementia often prevent people from seeking an early diagnosis, making lifestyle changes that could delay decline, or participating in research studies needed to find a treatment. During the conversation about brain imaging, DelBene asked about the availability of new and emerging brain imaging technologies at medical research centers and clinics—Is there enough access to carry out research projects? Dr. Grabowski gave the example of amyloid PET imaging at the ADRC, and how Medicare is helping out. 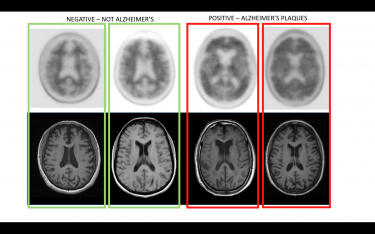 An amyloid PET scan is a positron emission tomography scan that detects amyloid plaques, a core feature of Alzheimer’s disease, in the living human brain. These scans can determine whether Alzheimer's disease pathology is or is not the cause of a person's mild cognitive impairment or atypical symptoms of dementia. Many neurologists believe that amyloid scans could be of great value in the clinic, as this knowledge would help them guide treatment and, in the future, select people for clinical trials of Alzheimer's treatments. However, these scans are prohibitively expensive for families, and they are not covered under insurance plans or Medicare. That might change, thanks to a special arrangement with the Center for Medicaid & Medicare's (CMS) Coverage with Evidence Development. Now, the CMS is paying for one amyloid scan for patients who enroll in the Imaging Dementia—Evidence for Amyloid Scanning (IDEAS) Study at specialty medical centers, including the ADRC. The study will determine whether having the amyloid scan for diagnosis purposes actually made a meaningful difference in the patient's care and quality of life, as reported by the treating physician and Medicare use records. If the evidence makes a convincing case, Medicare and other third-party payers could agree to reimburse amyloid imaging for the purpose of precisely diagnosing a neurodegenerative condition. The group rode the elevator up to the neuropathology lab, where researchers in the ADRC Neuropathology and Molecular Testing Core perform about 85 brain autopsies each year and develop innovate ways to study the biology of neurodegenerative disease. We met up with Allison Beller, Research Manager, and Caitlin Latimer, Neuropathology Fellow, who was recently awarded funding in an ADRC supplemental grant for training future leaders in neuropathology. The first mission of the ADRC Neuropathology and Molecular Testing Core, led by Dr. Dirk Keene, Associate Professor of Pathology, is to perform the autopsies on ADRC research participants who consent to brain donation. Latimer explained how they slice the brain tissue and stain it with antibodies to visualize the plaques and tangles, in order to determine an exact diagnosis. They can compare the neuropathological findings to the patient's clinical history and genetics to refine their understanding of how pathology and gene variants relates to symptoms. Dr. Latimer showed the group images of tissue slices, and also entire post-mortem brains, up on the projector screen. DelBene, who has a background in immunology research, has handled human tissue specimens before, so the images didn't make her uncomfortable in the least. Dr. Latimer spoke about the neuropathology core's mission to develop more sensitive measures to quantify tangles of tau pathology, which has been shown to reveal more about the nature of clinical symptoms than measurements of amyloid beta plaques. They also now have a way to study the different compartments within neurons, such as synapses (the connections between neurons). And, perhaps most exciting, Dr. Keene and Dr. Jessica Young of the UW Institute for Stem Cell and Regenerative Medicine, are now collecting cells from ADRC study participants, reprogramming them into pluripotent stem cells (iPSCs), and then differentiating them into neurons. These biological samples will allow them to study the biological pathways of disease risk and test potential treatments in the context of the unique genetic background of individual people. The ADRC also has a mission to study non-Alzheimer's disease dementias. Dr. Kimiko Domoto-Reilly spoke about her efforts to make frontotemporal spectrum disorders (FTD) into a research focus of the ADRC in Seattle and recruit FTD patients and mutation carriers into longitudinal studies through the ADRC and other international research efforts. These neurodegenerative conditions affect the frontal and temporal lobes and impact language and/or behavior and motor systems. She highlighted her interest in people who carry mutations linked to FTD and amyotrophic lateral sclerosis (ALS). Not only do they provide researchers with an unprecedented opportunity to identify biomarkers of disease progression, but these individuals could also be the first people to benefit from emerging therapies. 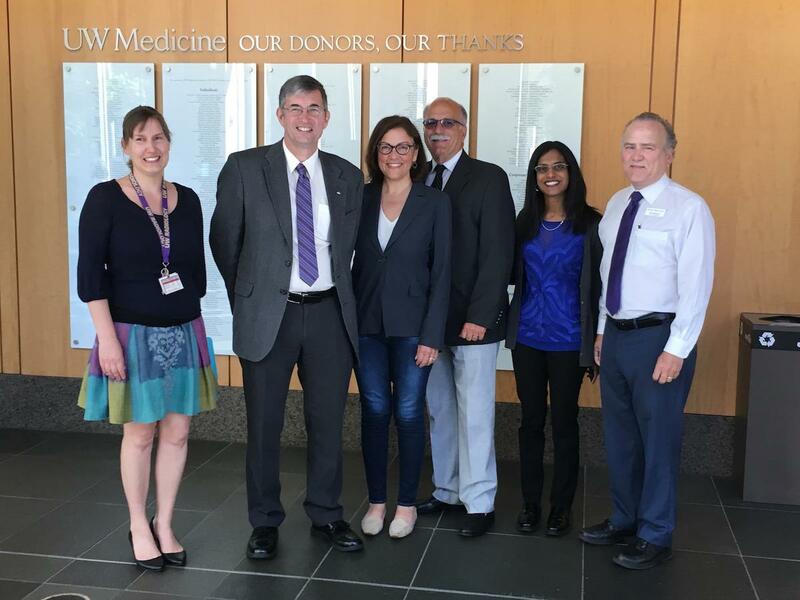 On the last stop on the tour, the UW Memory and Brain Wellness Center's clinical space, DelBene sat with some of the clinic team and the Alzheimer's Association WA State Chapter's Bob LeRoy and Peter Newbould to talk about the challenges and opportunities for people diagnosed with memory loss and their care partners and Medicare/Medicaid funding. In the context of dementia care, Medicare is a federal health insurance program that pays for inpatient hospital care and some of the doctors' fees and other medical items for people with Alzheimer's or dementia who are age 65 or older; Medicaid is a federal program that pays for long-term care for people who have used up most of their own money. One in 4 people with dementia are on Medicaid. In the midst of these challenging situations, the UW Memory and Brain Wellness Center supports families on the journey with memory loss, especially by creating opportunities for patients to capitalize on remaining strengths and intact abilities, while adjusting to challenges over time. 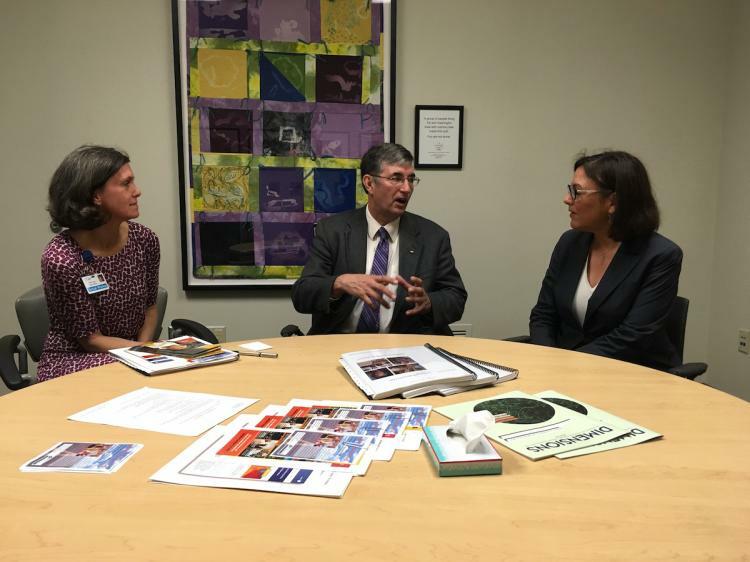 We showed DelBene our handbook A Basic Guide to Living with Memory Loss, created with input from patients and care partners. We also highlighted the new Integrated Memory Care, an enhanced care program for patient-caregiver dyads struggling with communication, behavior issues, or depression and anxiety. The six-session psychotherapy intervention, developed by the clinic team, provides education about dementia and training in helpful ways to adapt. Learn more about the MBWC's Community Events & Programs for people living with memory loss. We could have used another hour (or two! ), but we think Congresswoman Suzan DelBene has all the information she needs for her time back in Washington DC. “On behalf of our patients and their families, the UW ADRC is incredibly grateful to Congresswoman DelBene for championing this work,” says Dr. Grabowski. Making Sense of Alzheimer's site, an online gallery of ideas for people to understand the past, present and future of Alzheimer's disease.